“Don’t overcrowd… two or three cats do better than a dozen. Give them as much liberty as possible. Feed them well and keep them spotlessly clean. Breed your own winners by careful selection and line breeding, and above all, don’t coddle your cats!”. Another name that has become synonymous with the fine blues is that of Miss Evelyn Langston, whose Allington prefix is still one of the most respected names in the fancy today. There are many famous blues from the Allington line, but perhaps the one to have the greatest influence on our present day blues in America was “CH Mair of Allington”. She had an extreme head and very round eyes. Mair can be found as the grandmother of many of our all time greats. 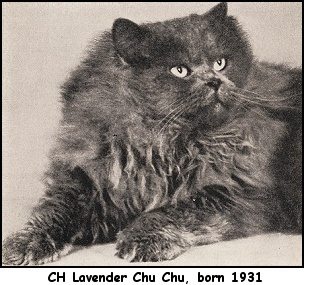 Her two litter sisters, “CH Morfydd” and “CH Myfanwy” were destined to be exported to one of our own noted blue breeders, Mrs. Arvid G. Ohlin, of the famous Wimauma cattery. Several notable descendents of Mair are “Rosita of Allington”, “Dylan of Allington” and “Dear David”, “June Rose Bear” and “Donald Duck” of Dunesk. P.M. Soderberg, cat author, theorized in tracing the history of the blues, that there was no gradual improvement in type. Rather, quite suddenly there would appear a variation, creating one outstanding cat. During the next few years this cat’s influence would be great. Then there seems to be a period of little or no progress until another animal of unusual quality appears. His theory could well be applied to Mair and her progeny. Many of the most outstanding blues in the show ring today trace their heritage to her. A. C. Jude, the famous geneticist, once said that “It isn’t that man creates, but just that he operates with the variations that occur”. Paralleling the rapid growth and improvement of the blues in England was the beginning of our own great blue fancy in America. 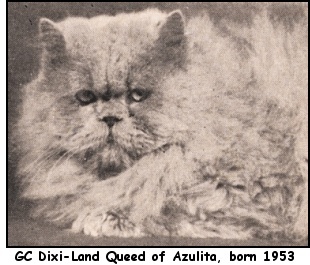 Unfortunately, my research turned up little data of the early blue cats in America. However, we are fortunate in having two pioneers of the blues still active in the fancy today. These two stalwart breeders need little introduction, for Elsie Hydon and Annie B. Revington ARE the history of blues. What blue pedigree today doesn’t record a heritage of Lavender (Miss Elsie Hydon) or Dixi-Land (Mrs Anne Revington)? Miss Hydon acquired her first blue queen, “Avril”, in 1911. 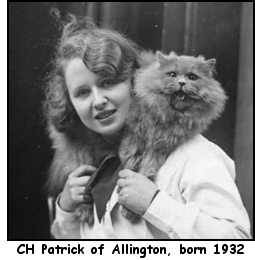 Her initial interest in the cat fancy can be traced back to 1898. 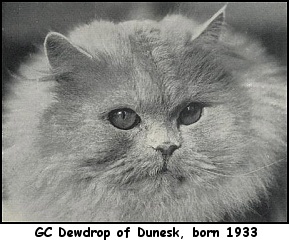 It has been written that she imported a total of sixty cats during her career, and exported all over the globe. Mrs. Revington, of Bristol, Tennessee, made her entry into the fancy in the “vintage year” of 1923. She is still a respected, active judge. Always tough competition, she can usually be found as an exhibitor at the annual Cotton States show in Atlanta. Her famous “GC Dixi-Land Montpelier Victor” is often cited as near perfection. Another of her males to become the sire and grandsire of many of our best blues was “CH Dixi-Land Wycliffe Encore”. Though he died at an early age, his excellent progeny were numerous. To pick only a few of the fine cats these women have bred is an impossible task. Several others joined them in leaving their mark on the blue fancy. Mrs. Eva T. Hariss, Mrs. Ben Kendrick and Mrs. F.L. Tebbetts were all early fanciers. The 1930’s brought Mrs. Foster Prather and Mrs. Ohlin under the challenging spell of the blues. The 1940’s brought Mrs. Merald Hoag and many others into the fold. Those joining in the search for perfection in the last twenty years make an endless list. It takes a “special” kind of breeder to work with the blues. It takes a great deal of patience to compensate for the seeming lack of progress. There are few rewards in breeding blues. The fancy expects them to live up to standards with none of the faults that are excused in other colors. Just a “good” blue is not enough. It must be a near perfect specimen, as faults in the blues simply are not tolerated. Still, the blues claim new dedicated advocates yearly, each striving, planning and working toward the grandest achievement of all… bettering the best.